Limerick Summer Music 2018 welcomes the return of Limerick International Singer! 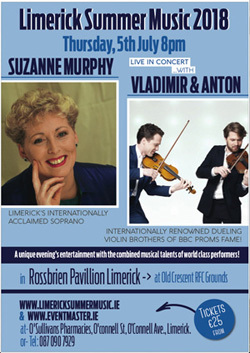 Following on the success of last year’s inaugural concert, Limerick Summer Music 2018 returns with a unique concert evening which will combine the musical talents of Limerick born internationally acclaimed ‘diva’ Suzanne Murphy on stage with Vladimir & Anton – two highly popular classically trained brothers from Slovakia. 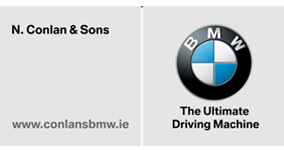 Limerick Summer Music is a new concept in musical entertainment for music lovers which debuted successfully in Limerick last Summer, and this Summer the Concert will take place again in a large 700 seater marquee in the grounds of Old Crescent RFC in Rosbrien, at 8.00pm on Thursday, 5th July 2018. This year’s Concert will feature Limerick’s own Suzanne Murphy making a welcome return to her native city. Suzanne won many Feile Luimni awards and performed with the Cecilian Musical Society and the Limerick Choral Union. She was a member of the popular folk group WE4 who achieved great popularity and success with chart hits and frequent TV appearances on RTE and BBC television programmes. After WE4, Suzanne made a highly successful entrée into the demanding world of Grand Opera as a soprano in great demand from opera houses throughout the UK, Europe and the Americas. She was awarded honorary doctorates by UL, Cardiff University, the University of Glamorgan, and the Royal Welsh College of Music and Drama, where she directs the opera programme, for her work in music education. This year, she made a highly successful return to the Opera stage, after an absence of 15 years, in the role of ‘Marcellina’ in Irish National Opera’s presentation of ‘The Marriage of Figaro’ in Wexford and the Gaiety in Dublin in April. We are delighted that Suzanne has agreed to return to Limerick for this unique concert where she will sing a number of songs from her varied repertoire including folk music, Irish songs, songs from the musical shows and popular operatic numbers in a look back or retrospective on a stunning and varied singing career. Also on stage will be the international violinist brothers Vladimir & Anton, who will perform well known classical pieces and also play light bright popular Eastern European melodies and both classical and modern tunes with their own musical interpretation. The ‘duelling violins’ of the Slovak brothers have performed on the BBC Proms and on numerous occasions at major venues throughout the UK and Ireland, including University Concert Hall Limerick, the Cork Opera House, and recently at the National Concert Hall Dublin with the RTE Concert Orchestra. Vladimir & Anton’s concert performances always enjoy an enthusiastic audience response as we saw at last year’s Limerick Summer Music inaugural concert which ended in sustained standing ovations. Tickets: €25 each online from www.eventmaster.ie and O’Sullivan’s Pharmacies, O’Connell Street and O’Connell Avenue, Limerick. ◂ Peter Doyle elected President of Old Crescent RFC for 2018-2019 Season!